New Year’s Eve is only a month and a few days away, which means that the countdown for Decadence begins now. As one of the most renowned winter music festivals in the country, the curators behind it all made sure to bless us with this year’s official event announcements. The popular NYE festival will once again be ringing in the new year with some of the most highly praised artists in the electronic music game. Taking place in the heart of Denver, Colorado this December 30th and 31st, celebrating new beginnings couldn’t get better. The festival’s phase one lineup was released a while back, and even then Decadence Colorado surely proved itself as an event worth highly anticipating. Decadence’s organizers strategically presented this year’s artists to potential attendees, slowly revealing each one individually. Half of the lineup was revealed on one night and the rest was revealed subsequently the next day, one post at a time. What a way to keep us on our toes! Just over two weeks ago, the remaining artists were presented and let’s just say that the final overall lineup is as diversely electrifying as it can get. This year’s Decadence Colorado extravaganza will feature exclusive acts from names like Eric Prydz, Griz, Illenium, Above & Beyond, Bassnectar, Alison Wonderland, Nora En Pure, Zed’s Dead, Claude Vonstroke, Big Wild, Marshmello, 3LAU, Camelphat, Walker & Royce, 1788-L, Anjunabeats all-stars Spencer Brown and Ilan Bluestone, The Him, Deorro, Mikey Lion & Lee Reynolds, and a special debut appearance by Anti Up, Chris Lake and Chris Lorenzo’s dynamic duo stage name. Oh, did we mention dubstep legend Skrillex will be making his U.S. festival comeback at this year’s event? Just another reason to be hyped for this winter’s most captivating music festival. 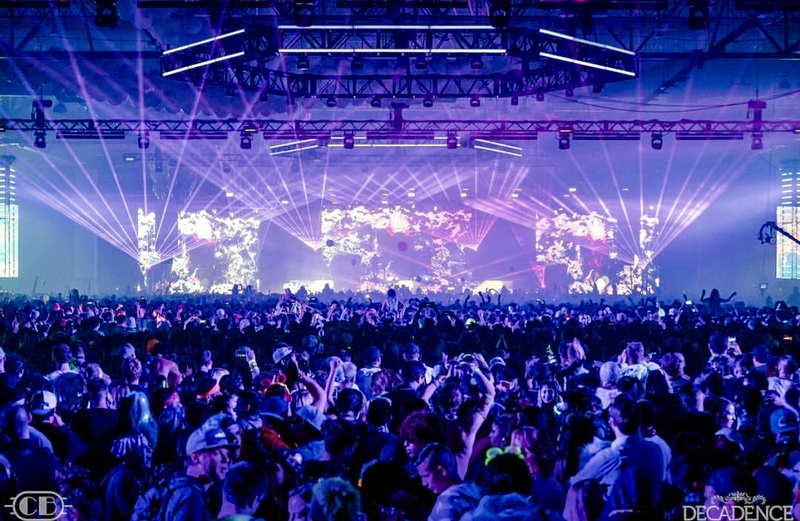 Decadence is known for its uniquely curated winter wonderland-like rave production, and over the years since its debut appearance nothing’s proved otherwise. With names such as those on this year’s lineup, there is no doubt this upcoming NYE experience will be spiked at an all time high. We’re thrilled to discover what’s in store for this year’s musically inspiring new year’s celebration. Who said festival season is over once winter comes around? Decadence Colorado, the countdown begins now!